Thanks to JoBlo, we now have a brand new look at Armie Hammer’s new film Mine. 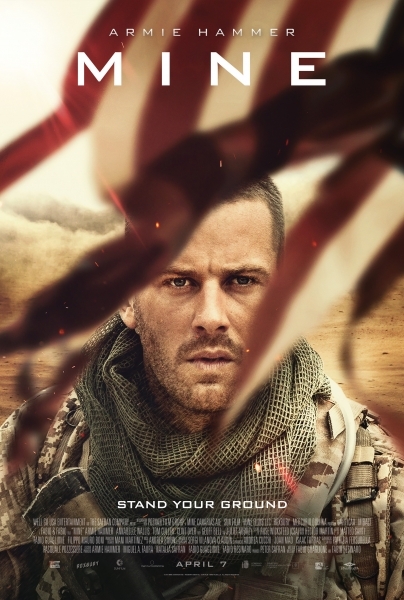 Mine sees Hammer as a U.S. soldier who, after a mission falls apart, steps on a mine and is stranded for 52 hours fighting for survival against his enemies, the hostile environment, and the psychological toll of the situation. I can’t begin to imagine the kind of mental make-up you need to not just be a U.S. soldier, but a soldier in this kind of situation. It’s a conversation that can go on for quite a while, but to cut it short, the bottom line is that my respect for the men and women who put their lives on the line to protect our freedom. As for the movie and how it looks, I’m very interested. I’ve talked to some and heard from others that they just aren’t interested in it because it’s literally Armie Hammer standing in one spot while events take place around him. I get that, but those obviously haven’t seen films like Locke starring Tom Hardy, 127 Hours starring James Franco or even Buried with Ryan Reynolds. While yes, it does seem odd that a movie would follow a character in a single position, but if it has a good story and a strong character, why not? Why can’t it be good? Why not give it a chance? Anyway, take a look at the brand new clip for Mine below and after doing so, let me know your thoughts in the comments. Are you interested in Mine? Why or why not? Mine has a limited April 7th, 2017 release date. Poll: Which April Release Are You Most Excited For?